February 2017 - my name is Food. 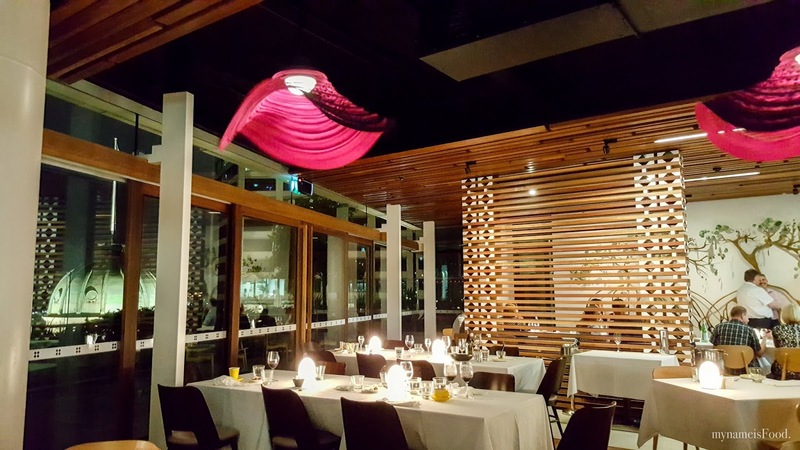 Otto's parent company, the Fink Group, actually operates Quay Restaurant, the famous and most awarded restaurant in Sydney. 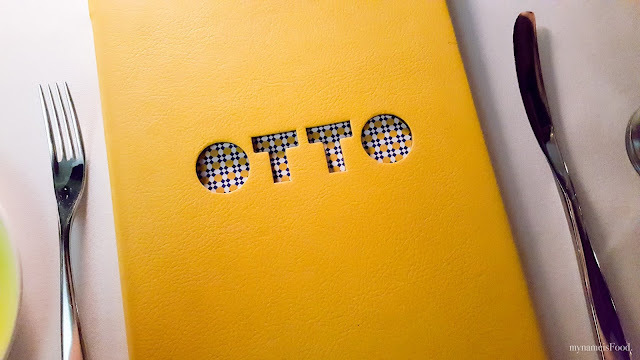 So no wonder, when Otto opened, there was quite a hype and even getting their first Hat for it already. 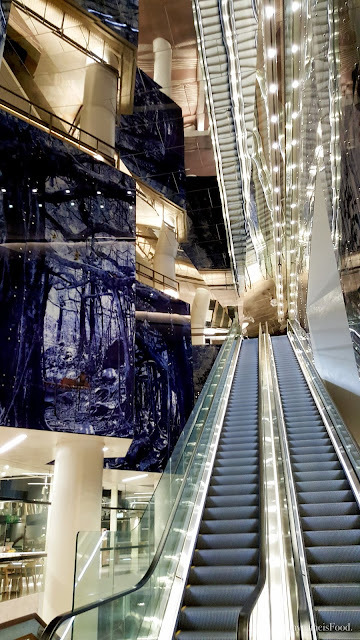 Located in the new 480 Queen St, you have to be able to try and find your way there as you can get a bit lost. But simply go up the long escalator and on your right, will be Otto. The interior design is rather unique with a magenta coloured twisted ceiling fans, wooden wall screens and an open kitchen. 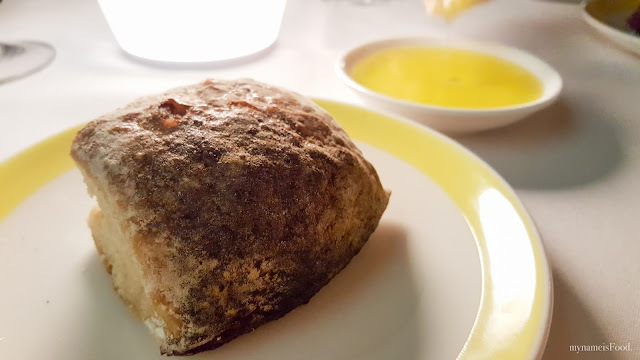 Our meal commenced with complimentary sourdough bread and olive oil, which I did not fully enjoy as the bread itself was rather hard and crusty. Once you break it however it was soft on the inside but densed. We both quite enjoyed the olive oil as it had a pepper undertone. 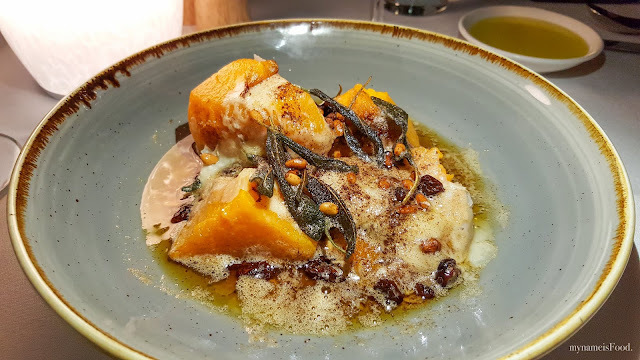 Zucca Arrosto, roast pumpkin served with sage, parmesan, muscatels, pine nuts and burnt butter. Hands down, this has to be the best roast pumpkin combination and dish I have had for a long time compared to other places. 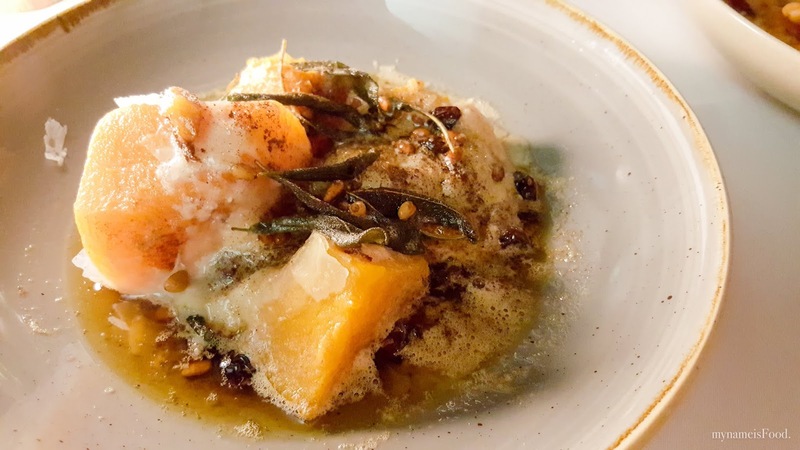 Everything worked well, adding that notes of crunch from the pine nuts, the saltiness from the parmesan, sweetness from the muscatels and the charring taste and smoky flavour from the burnt butter. The burnt butter was just right, lovely and delicious. I wouldn't even mind picking up my leftover bread and dipping it into the burnt butter sauce, it was just aromatically flavoursome. 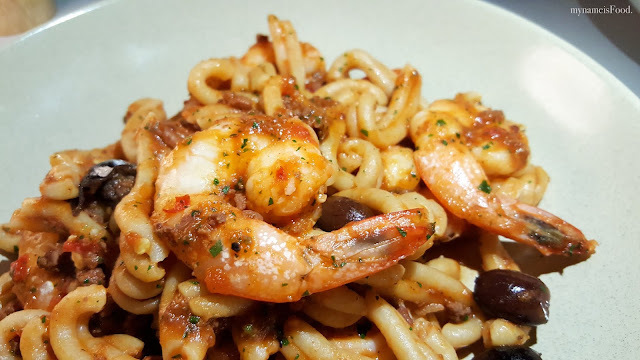 Strozzapreti, twisted pasta served with banana prawns, garlic, chilli, black olives, tomato and calamari sauce. Although ordering a seafood pasta isn't something I would usually get unless there was scallops or crab in it, I thought I'd give this a try. When it first came out, you could automatically see the big banana prawns smothered in the sauce, garlic, chilli and herbs. 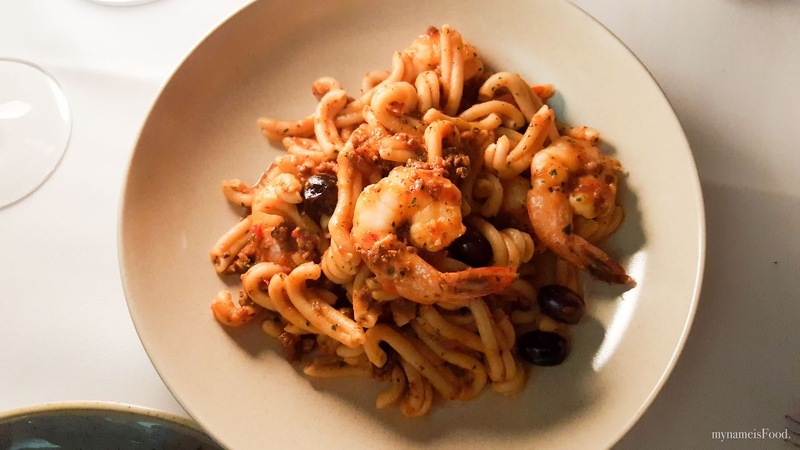 The twisted pasta was nice to see for a change from the typical long or penne pasta. The black olives and the rest of the condiments went well with the whole pasta dish however I did feel that the tomato and calamari sauce seemed to just have been tomato sauce. It wasn't fishy nor calamari taste-like. 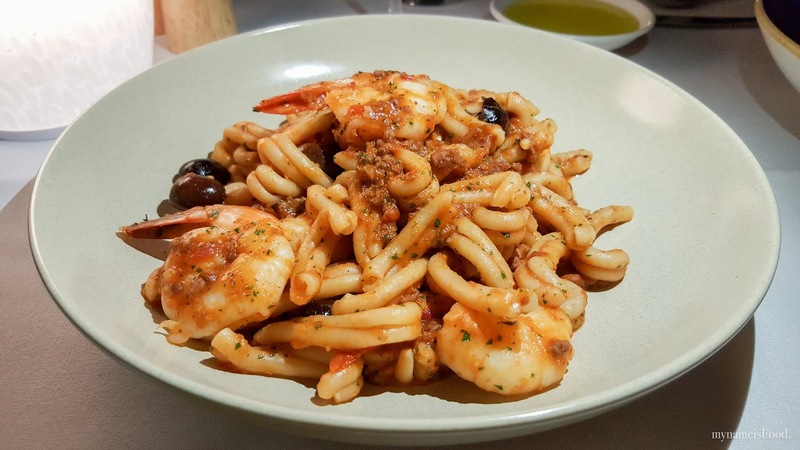 The pasta was cooked al dente and the prawns were not overpowered by the tomato sauce. It was a nice pasta dish overall, however not something I would go back again for. 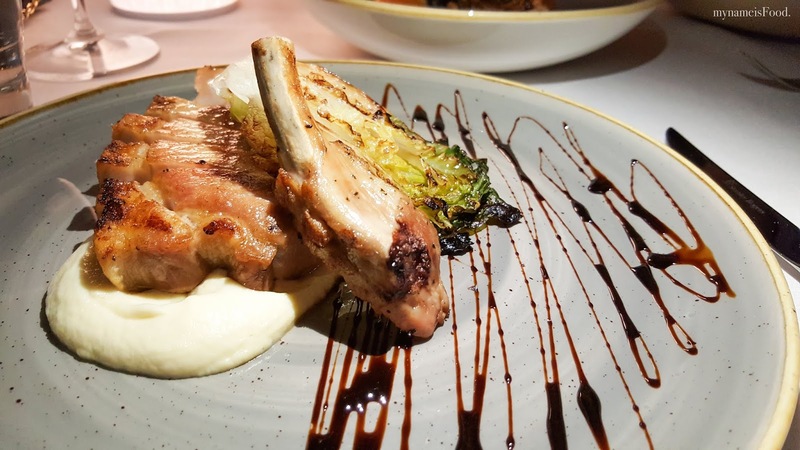 Maiale, a Byron Bay Berkshire Pork Cutlet served with cauliflower, char-grilled cos, garnished with balsamic. 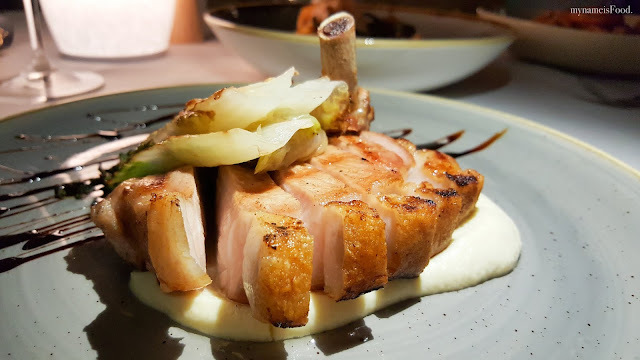 The pork had the right texture, not overcooked and had a good balance with its moist meat and not too sickening fat area. It had the slight charring also on the outside which gave it that extra smoky flavour overall. The char-grilled cos was nice as a side but felt that it was somewhat out of place in a way. What's special about Byron Bay bred pork was that it had the Berkshire marbling, being fed a special mixed grain diet. A quality pork with a sweet and juicy flavour along with its tender texture. Berkshire pigs originated from England and is one of the oldest pigs breed known, with its high levels of marbling to develop within the muscles. The cauliflower turned out to be incorporated into the mash and wasn't an actual cauliflower as what I originally thought. Smart idea to incorporate it however the mash seemed slighly gluggy however you could taste the slight hint of cauliflower creamy-ness. Although we didn't have enough tummy space to fit in more food, desserts or coffee, we will sure be back to try other items on their menu. 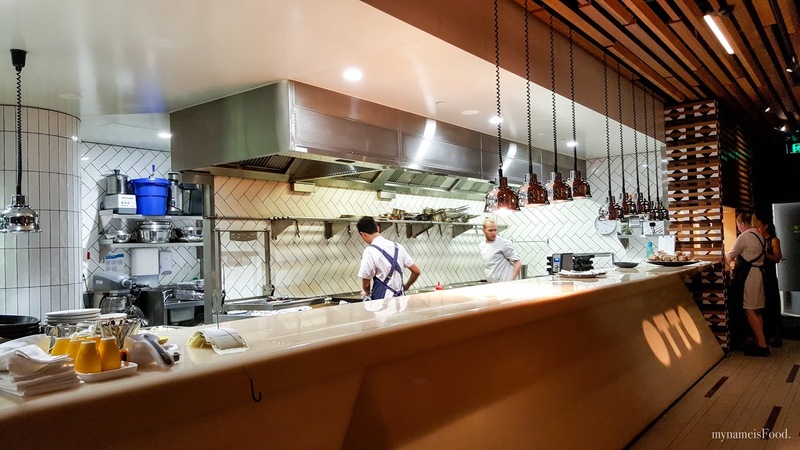 A traditional yet modern Italian fare using Australian produce, it's lovely to see when restaurants do support the local community. Doesn't Baskin Robbins reminds you of the old days where you would long for their ice cream, order a big scoop and try and eat it as quickly while enjoying it at the same time.. thought it's always hard when it's during Summer and it starts to melt quickly. After having our tummies filled with delicious Sushi, we didn't want to finish here so we decided to go somewhere nearby in which she suggested Baskin Robbins, so why not? 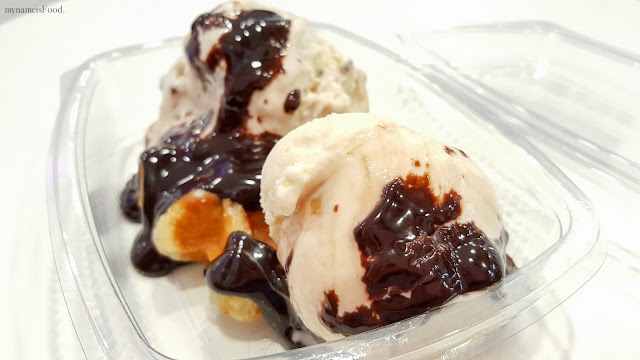 I thought..
We shared the 'Belgian Waffle' (AUD$6.90) which was a classic waffle topped with either hot caramel or chocolate sauce finished off with your choice of ice cream scoop which we ordered an an extra scoop since we couldn't decide or maybe we just wanted to have more. 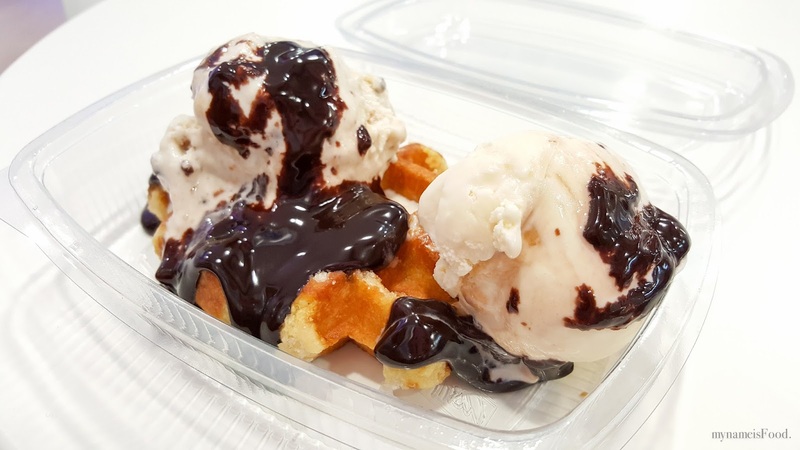 Chocolate sauce is always the way to go, but then if you do really love your hot caramel sauce or prefer it to be sweeter, then caramel would be yours. 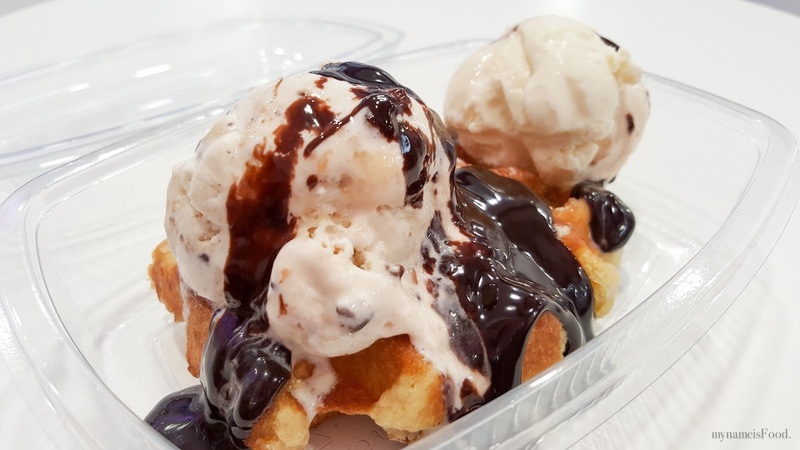 The belgian waffle was a good size for sharing and accompanied by the two big scoops, just made it better. You'll have heard about Betty's being similar to Shake Shack in the US, however we thought we'd give it a go ourselves without going into conclusions. 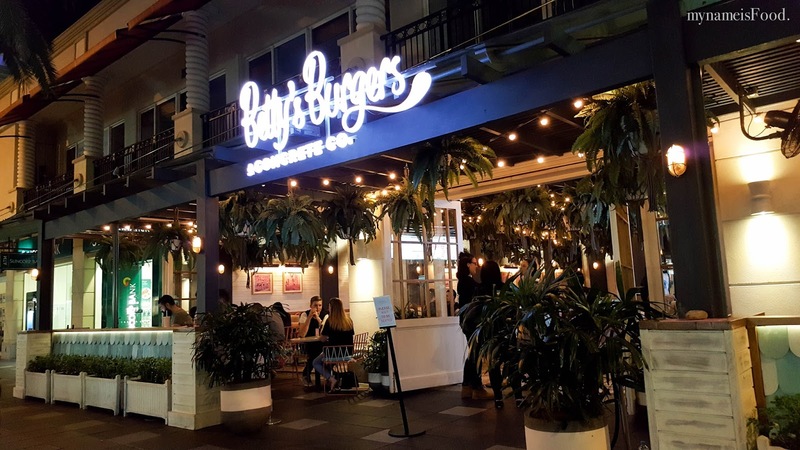 The original Betty's Burgers in Noosa has been on everyone's list when it came to burger-madness and when they decided to open up another in Surfers, we knew we definitely had to go. As soon as we arrived, we could see that it was getting quite packed and as we had a look through the menu, we were told to sit at a table and ordering would be at the counter. 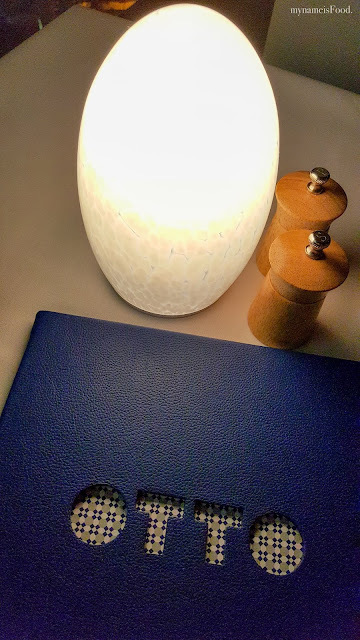 After ordering, you're given one of those vibrating buzzers until it vibrates to let you know that your meal is ready to be picked up from the 'Pick Up counter'. 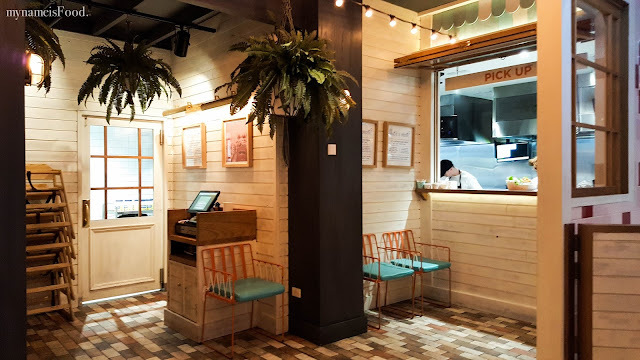 This non-table-service reminds me of a food court in a way just in a nicer and secluded environment with a beach feel. 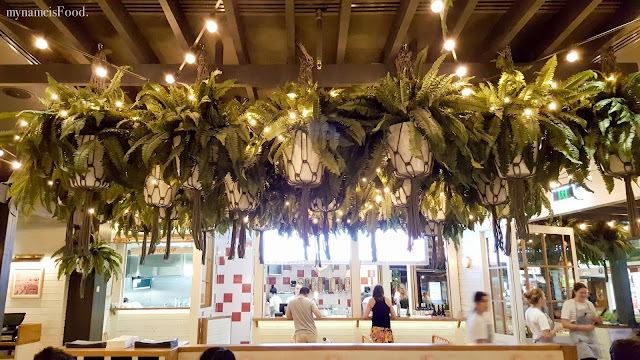 As you can see, basket of plants with garland lights hanging from the ceiling contrasted nicely with the orange and white metal chairs with turquoise cushions. 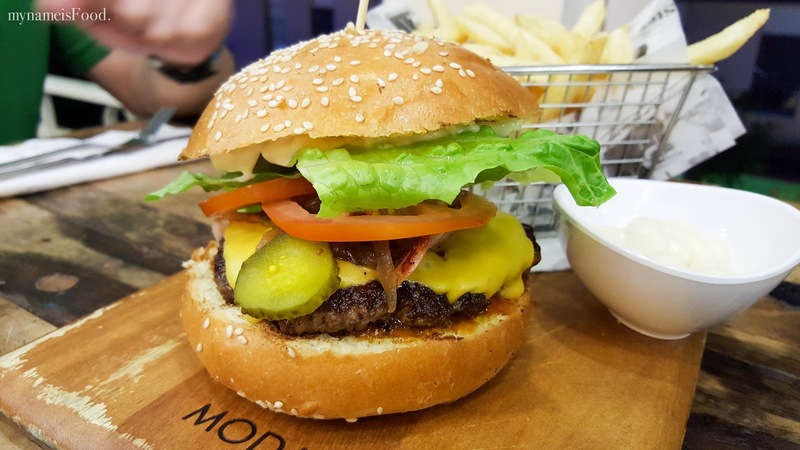 Having quite a straightforward menu with only seven burgers options, it allows you to try more and have a bit of sides and dessert here and there. 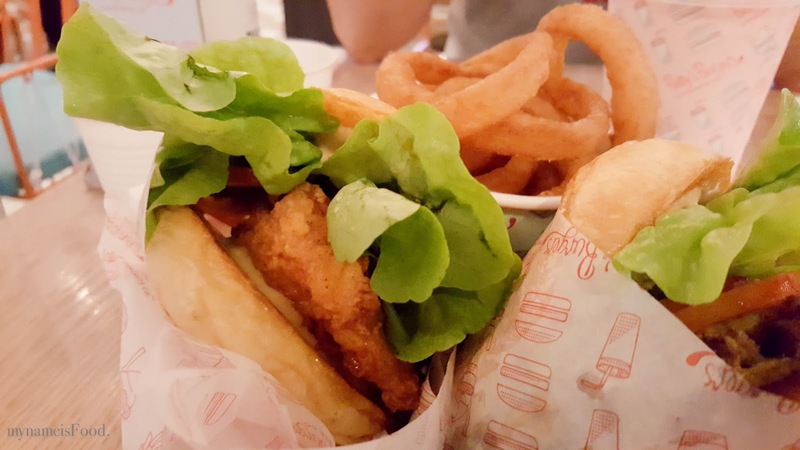 'Crispy Chicken Burger' (AUD$10) tried to resemble KFC but sadly it failed as I did feel that the crunchy batter wasn't crunchy and the size of the chicken did not fully fill the burger bun. 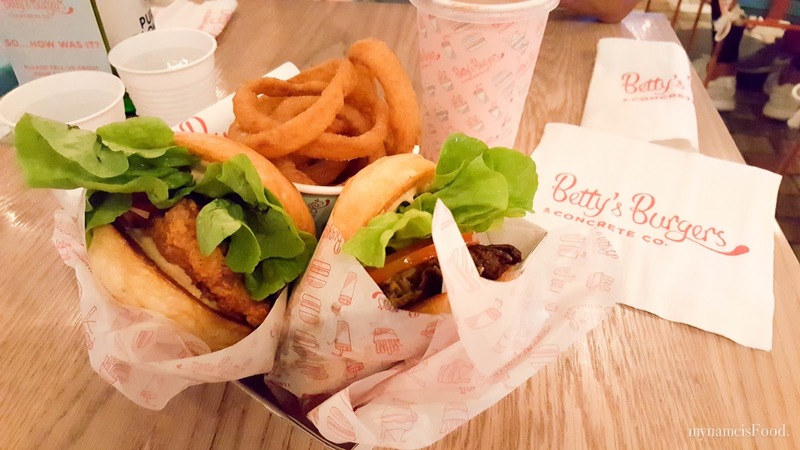 Though it wasn't as salty or oily as KFC, it blended in well with the rest of the elements, cheese, lettuce, tomato and Betty's special sauce. Overall, it was just another fried chicken burger that could have been better if the bottom bun wasn't soggy-ing up half way and that the top bun wouldn't be smaller than your big one piece lettuce. 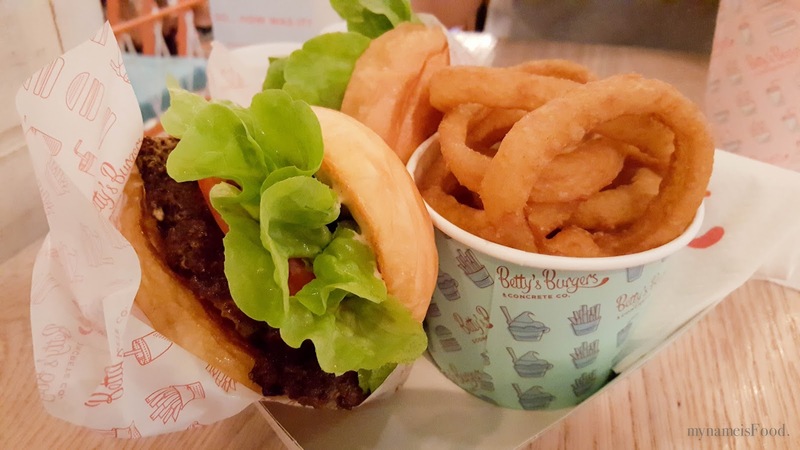 'Betty's Classic' (AUD$10) was what I would call a cheeseburger. 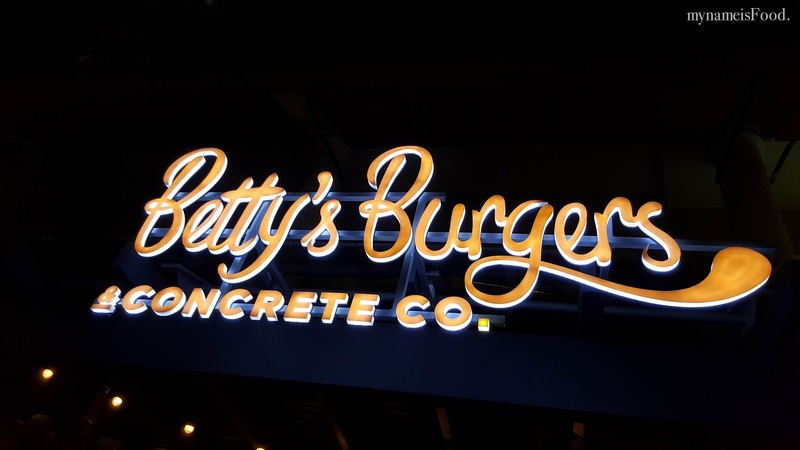 Angus beef, tomato, onion, lettuce, cheese and Betty's special sauce. 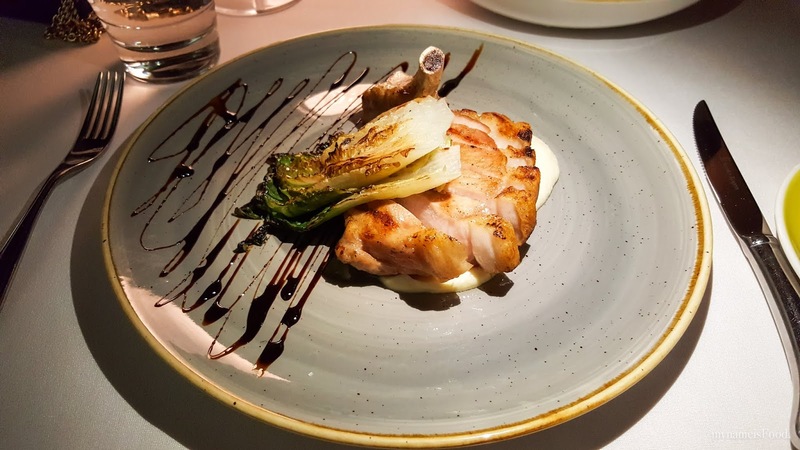 It did pack that fresh contrasting colours however with the price tag, the Mr did think it could have been bigger in portion as well as being more delicious than what it was. 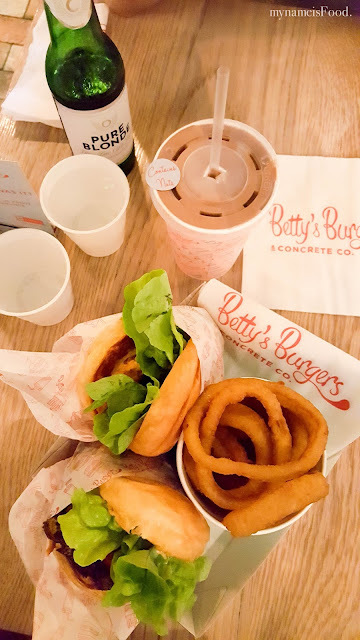 Although, yes the bun was a soft buttery bun which was great, however, that was one of the main causes of why we both did not really enjoy it as much. The bottom bun was soggy and the sauce was dripping over the paper wrap and basically, the bottom bun was too thin to be able to absorb that sauce and juices from the rest of the ingredients. It was just basically nothing special, just another cheeseburger.. Unfortunately, it didn't hit near anywhere the Mr's top burger list.. 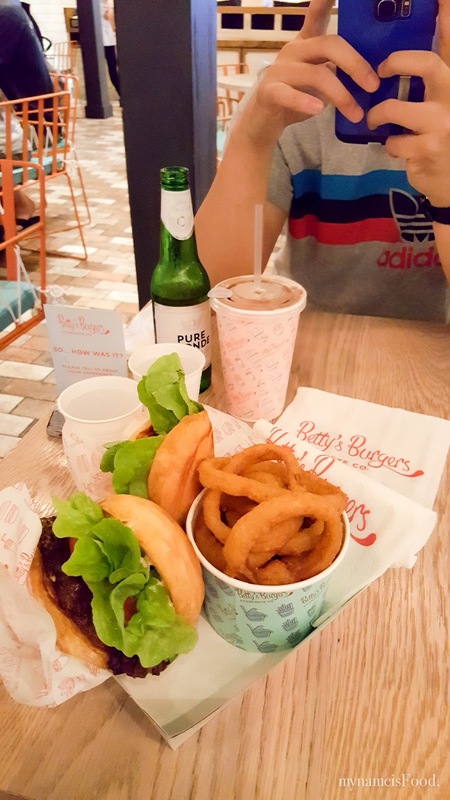 It was somewhat par of Ben's Burgers, another that we both felt it wasn't as great as what others have said about it. Ben's was dry, and we did have the same problem here as the meat patty was a bit dry and tasted quite salty with the sauce just overpowering everything else. Sadly, this wasn't a burger we would like to order again or eat more of as we did feel that in a few man bites, it would have just disappeared out of your sight. 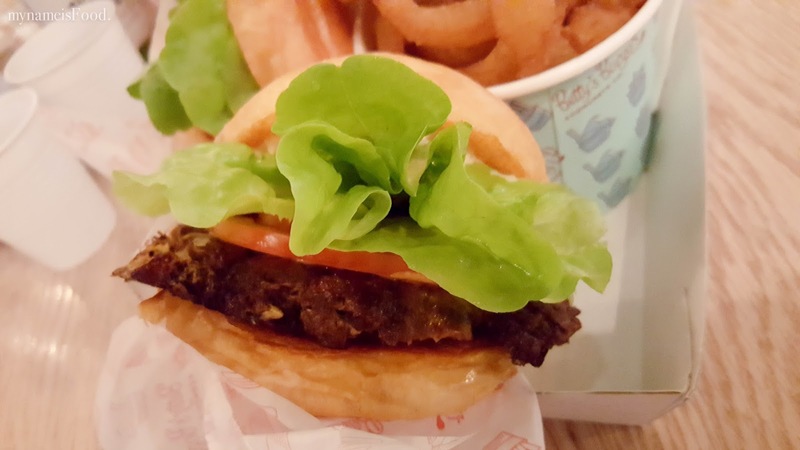 As you can see from the image above, the dry beef patty, the thin bottom bun, the one piece lettuce folded in half, the one slice tomato, it just wasn't great overall.. 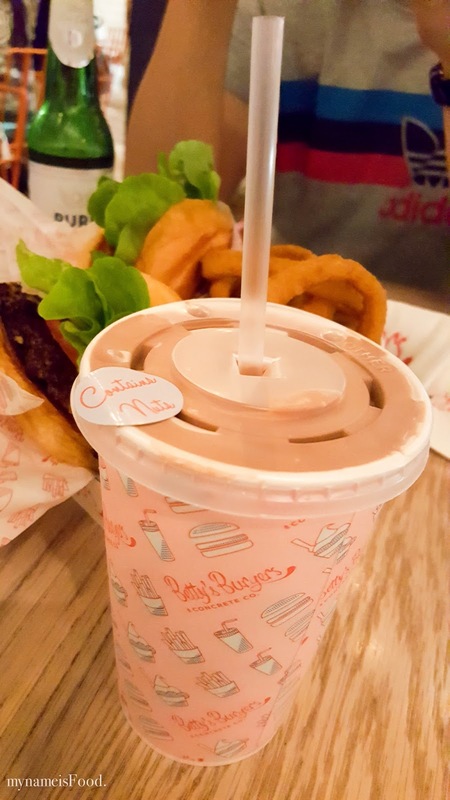 Milkshakes, whenever they're on the menu, I always seem to get them... though when I really don't feel like drinking and eating both sweet things at the same times, then I usually don't. However, I thought I might as well give it a try and sadly, another disssapointment. 'Chocolate Peanut Butter' (AUD$8) For the price tag, it was quite small in size as well as it was so thick than the usual thickshake. Taking a long time for it to cool down before you could start sipping it, you would think it would've just been a better option taking the top off and getting a spoon to scoop the shake out of the cup. It was also very sweet and yes, chocolate and peanut butter is sweet but it could have been more balanced in terms of flavour. 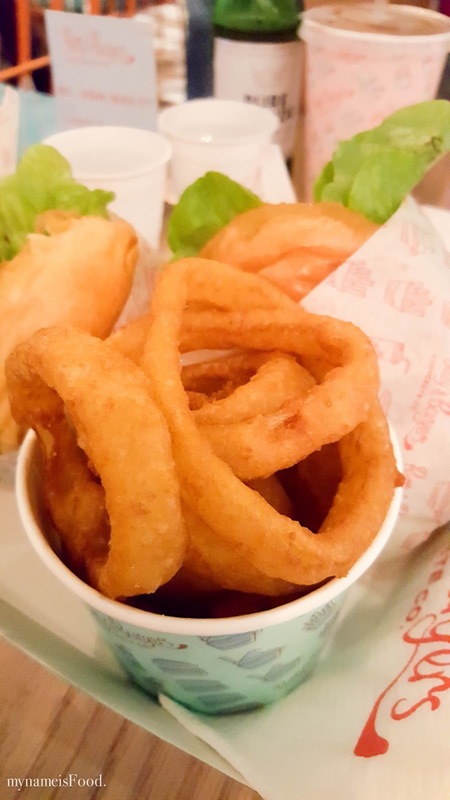 'Onion Rings' (AUD$6) were hand crumbed and we did pick this as we thought that the fries looked quite bland when everyone else in the restaurant was ordering them. It was served in a soft serve cup but there is just so much you could fill so again, I don't think the price really matches its quality and portion. It was just okay overall and I would still pick this again over the fries. 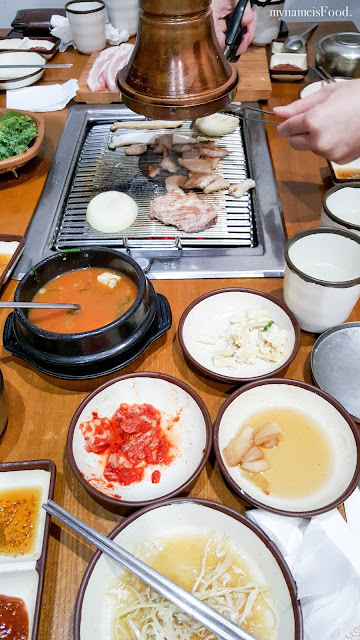 Although a few years ago I have been here for their Korean BBQ, I have never been back since it never came across in my mind to be first on my list of KBBQ places to go. 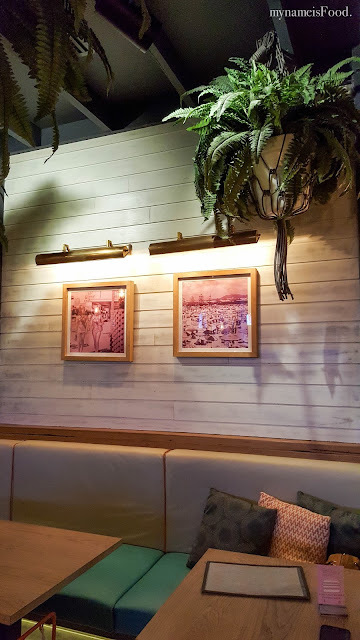 So when the time came to catch up with a few friends, we decided that it would be nice to dine here again especially after the refurbishments and renovations and all. It is smaller than how it used to be with now their previous venue has been replaced with other restaurants. Not long after you have been seated at your table, side dishes are brought out to start off your meal while waiting for your meals which allows you to fill your grumbling tummy that teeny bit more also accompanying your chats with friends or family or your date. 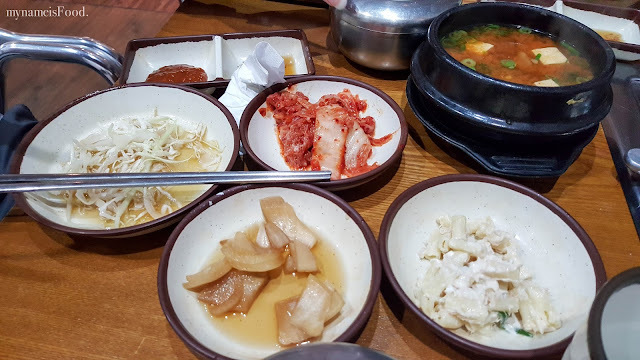 3 various side dishes including pickled onions, cold pasta salad and kimchi. 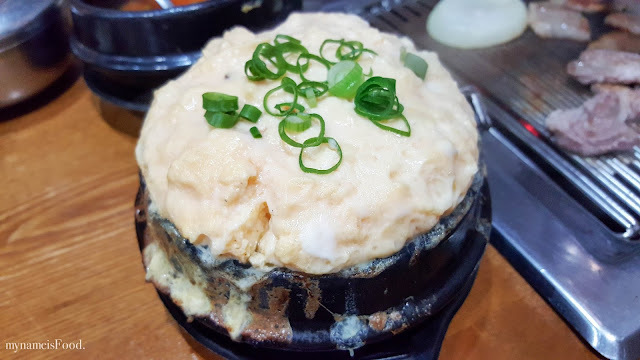 When you order a BBQ set, which we did, you are given Steamed egg in a hot stone bowl. This is a very popular dish to share when eating though it is something I rarely order to be honest. The flavour was very subtle and could have been seasoned slightly better. 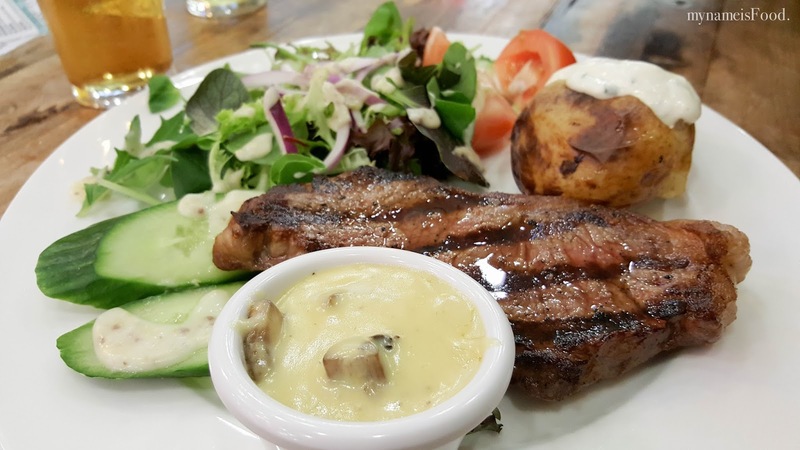 The portion was enough to share definitely for 2 or even 5 people around the table. 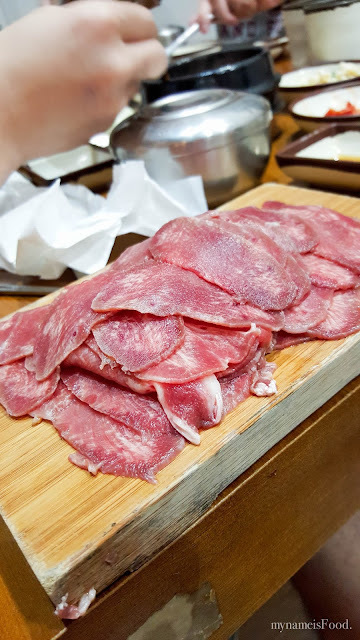 The inside was fluffy and moist, mix it along with your BBQ meat with a bit of warm rice and you got yourself a nice bite. 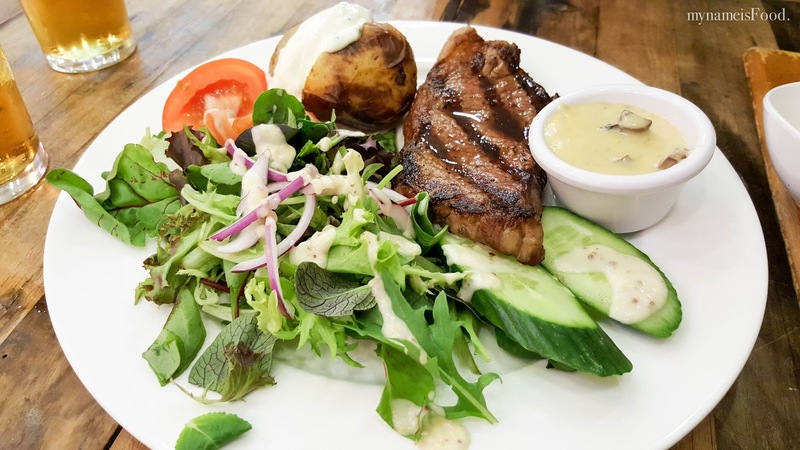 'BBQ Mixed Set' (AUD$85) consisted of both pork and beef in one set served with a plate of green leaves which would be great if a top up was available as it wasn't enough for the whole meal. A weird way to give vegetables as a part of a set when it only comes with 2 thin slices of mushrooms and 2 slices of raw onion. No greens, nothing. 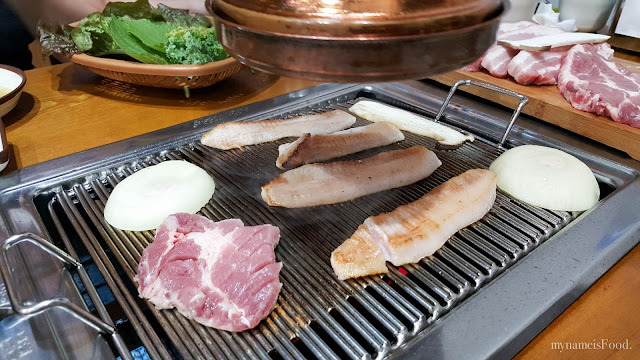 The mixed set had more pork than beef which was quite upsetting as when you buy a mixed set, you do expect a very big portion of meat but sadly, this was not up to the standard of other Korean BBQ places where you would be ordering at a similar price but receiving more meat. 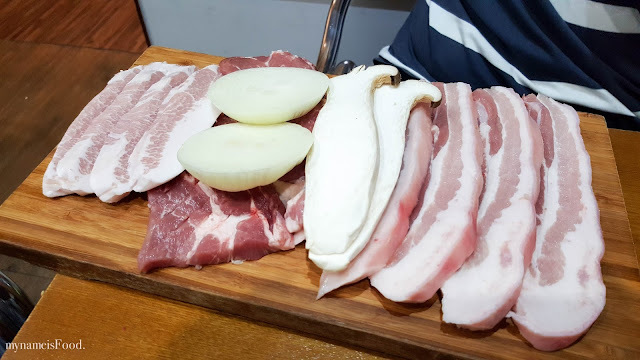 'Ox tongue' (AUD$18) was an add-on that we ordered which seemed to have quite a big portion, maybe even bigger than the BBQ set when compared to the pork belly itself or the beef itself. 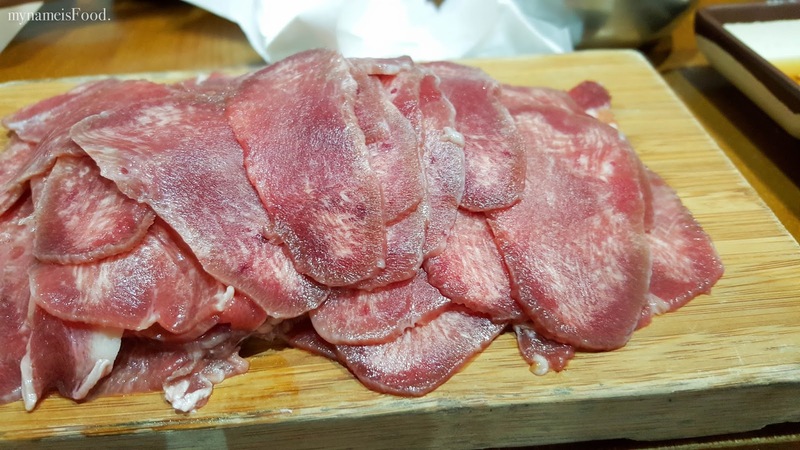 The ox tongue didn't seem fresh and looked frozen. Ox tongue is always great when grilled in charcoal as it grills very quick and has that smooth texture and can melt in your mouth when grilled right. Oh, and I nearly forgot. You also do get Fermented Soybean paste stew, a soup that is great for winter season or chilly weather that can warm you up inside. Definitely great when eaten with warm rice. 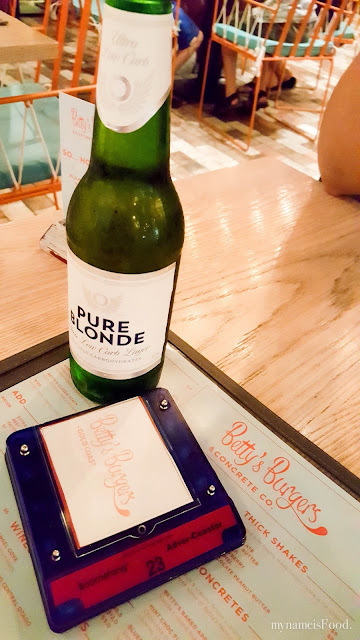 The only thing that did annoy me was customer service as we were seated at the back corner, it was very hard to call or get the waiter's attention. Either for filling up your water or topping up your side dishes or whatever it may be, they should be more attentive to diners. 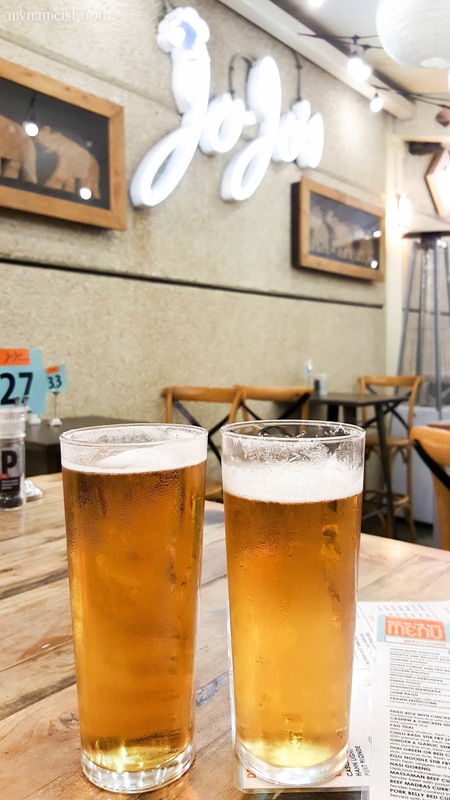 Jo-Jo's will be closing soon as rumours said so I thought a final review would be nice before they move to the new venue at West End. It will be moving after being in the same location for 37 years owned by Stefan, the same owner as Stefan Salon. 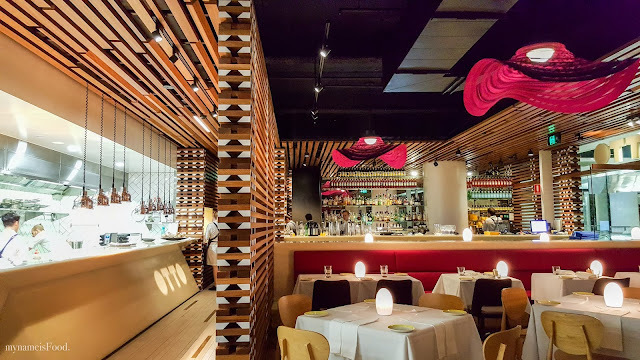 This place has always offered many diners various dining options from Modern Australian to Italian to Asian to Mediterranean. 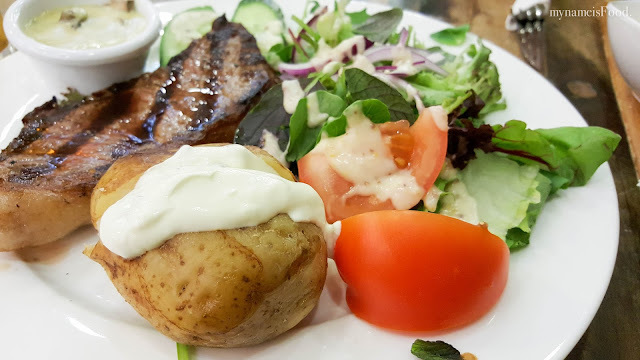 'Sirloin Special' (AUDR18.5) was a 200g Beef city platinum MSA grain fed from Darling Downs region served with fresh salad, steaming baked potato with sour cream. Add a garlic and chilli prawns or USA pork BBQ ribs if you prefer your meat served with a topper. Choosing Mushroom sauce is always somewhat safe, also for Pepper. However the Mushroom sauce here seemed to be creamier than the usual, though the creamy had a good consistency and simply just needed more mushroom. Yes, there were chunks of mushrooms in the sauce pot but in the sauce itself, it seemed to have had much more cream and not much mushroom. For those who do prefer a not so strong mushroom taste, then you would enjoy the sauce. But for those who do prefer a strong mushroom taste, you may feel that it was cream with a hint of mushroom. 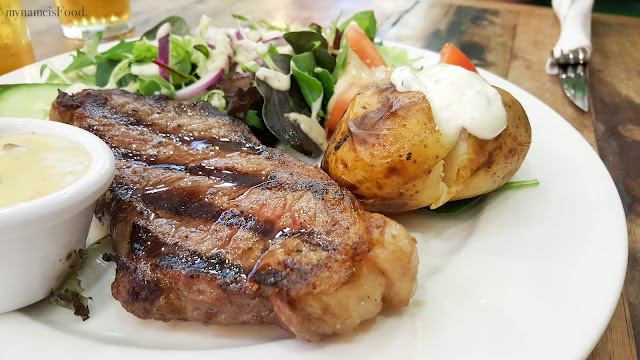 The beef sirloin was cooked to what we wanted, juicy and nicely char grilled. The steamed potato was okay, topped with a dollop of sour cream but was not seasoned overall. The fresh salad had a mix of greens, red onions and tomatoes with a drizzle of creamy sauce. 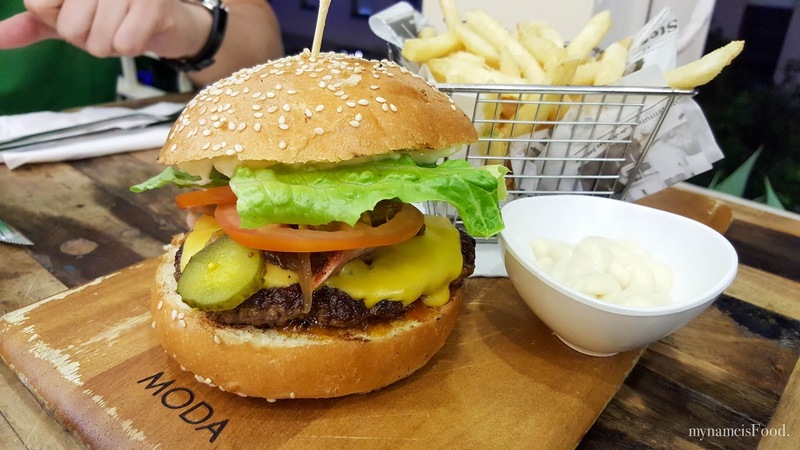 'Big Brissy Burger' (AUD$18.5) was a combination of Wagyu beef patty, melted cheese, pickles, bacon, tomato, melted cheese, cos lettuce, aioli, caramelised onion and chilli jam relish on a freshly toasted brioche bun. The brioche bun looked slightly dry when it first arrived on the table and it seemed to not have been sliced in half properly as the top bun was much more thinner than the bottom. However, I did feel that it worked as no one likes a soggy bottom bun as you always want the juices of the beef patty and the sauce all dribble down without ruining the bottom bun. 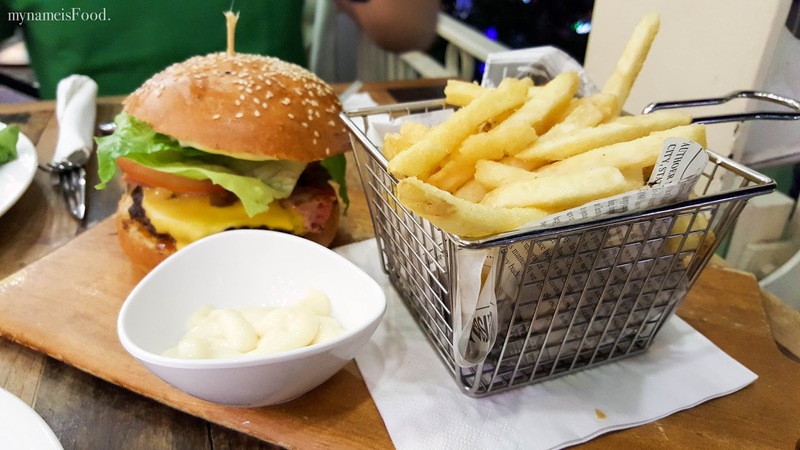 Add in a side of chips for AUD$3.5 for that extra crunch and to accompany your burger. 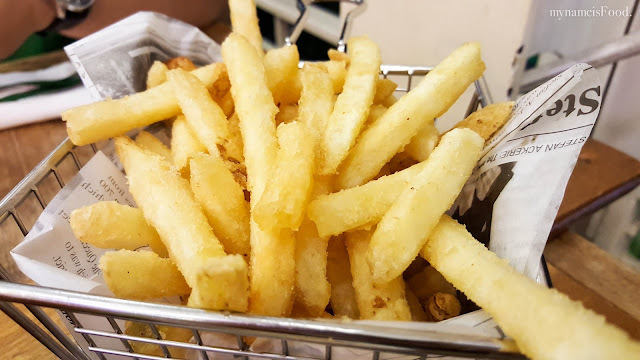 The chips were fried well and perfect served with a side of aioli sauce.